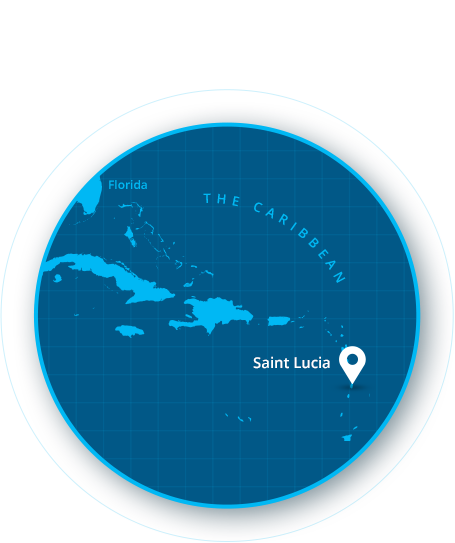 If there was ever an enchanting place created, it's the island of Saint Lucia. It's found in the fiery passions of its ancient volcano, the serene abundance of its rainforest and the rhapsodic charm of Marigot Bay. Even the twin peaks of Les Pitons, the island's iconic landmark, pair off as beautifully as two people in love. Experience the exotic allure of this island paradise with our all-inclusive vacations in Saint Lucia. Explore more of Saint Lucia’s exotic beauty with our Stay At 1, Play at 3 Program. 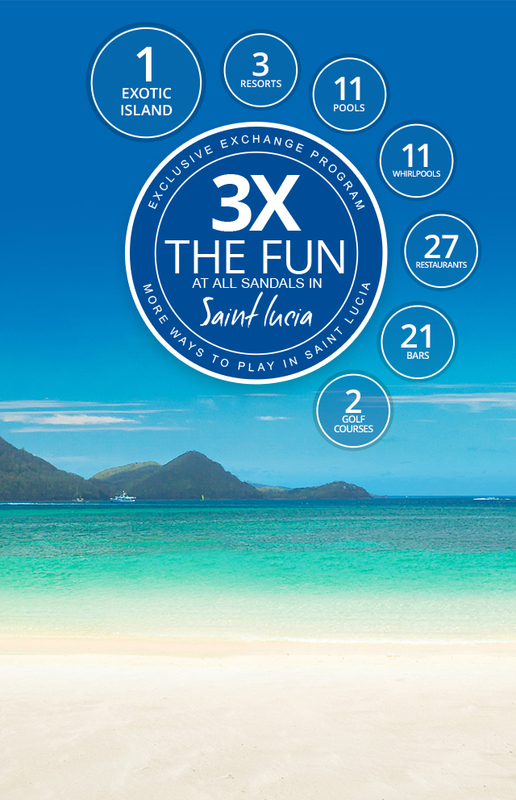 Our exclusive exchange program expands your dining options to 27 restaurants, gives you access to two amazing golf courses with green fees included, and lets you enjoy the vibrant entertainment that’s ever-changing from night to night at all Sandals Resorts in Saint Lucia. 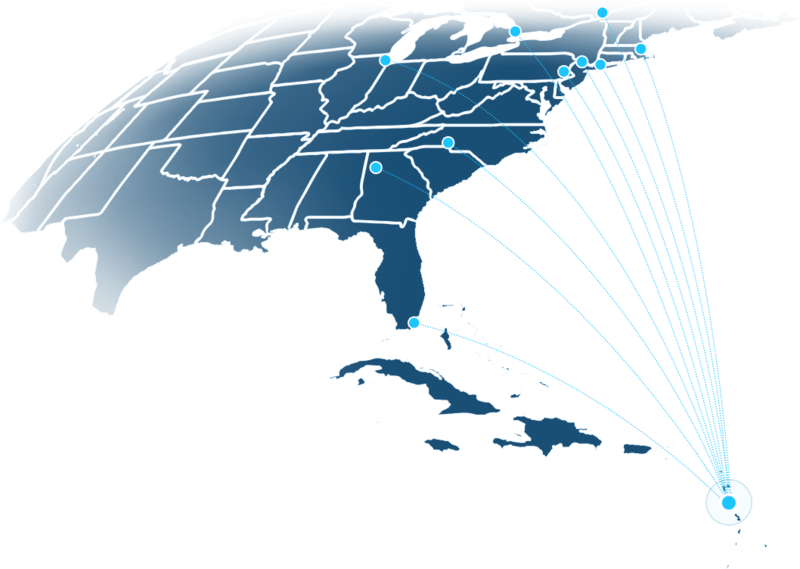 Plus, round-trip transfers are included between all three resorts. The world’s famous peaks of Gros Piton and Petit Piton offer a glimpse into the volcanic origins of Saint Lucia, a tantalizing taste of the dynamic forces that formed this beautiful island and. 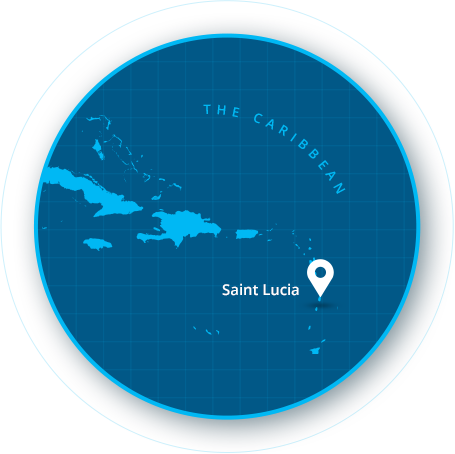 Hints of Saint Lucia's fiery nature can be found in the exotic dark sand that covers some of Saint Lucia's many alluring beaches and in the warm sulfur springs that bubble up from deep within the earth. 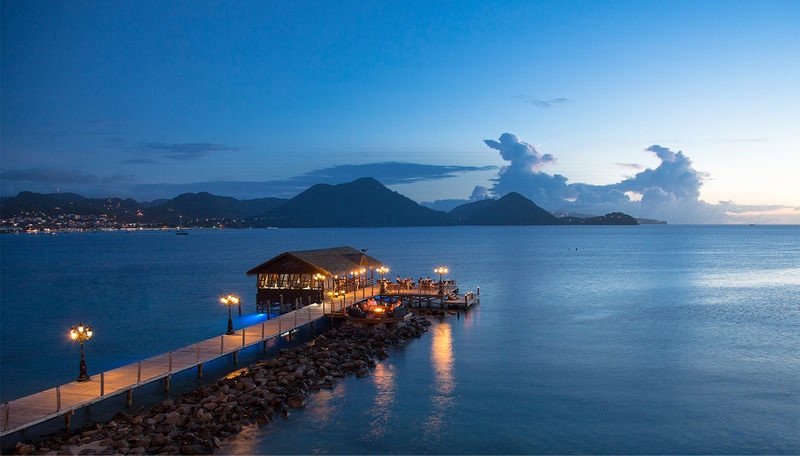 27 World-Class restaurants and 21 bars from Paris to Tokyo, Milan to the Pitons, your gourmand soul will revel in the succulence of classic, contemporary, and creative dishes served up in all three Sandals Resorts on Saint Lucia. You'll be an honored guest at any of 27 restaurants, each with its own unique ambience and setting. For a completely exotic experience, just steps from the beach - and some right on it - the Rondoval Suites is a haven featuring "suite-in-the-round" interiors of marble, stone, sea glass and mosaic tile that open onto a private patio with plunge pool, whirlpool, hammock, dining area and outdoor grotto shower. 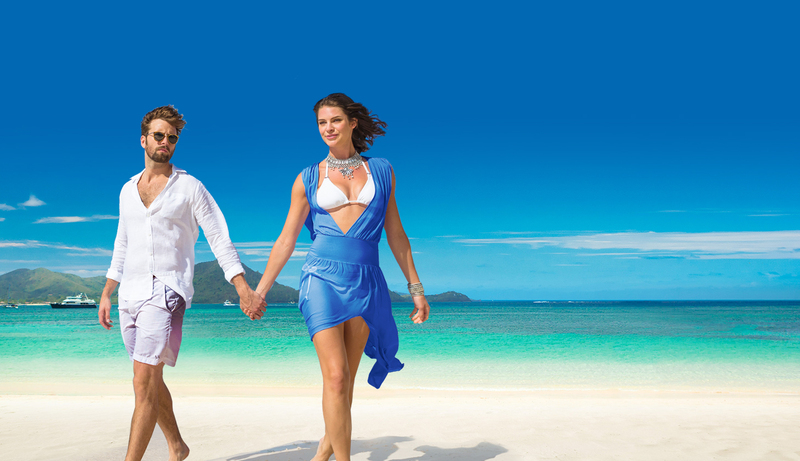 Everything at Sandals Grande St. Lucian is designed to bring you closer to the Caribbean’s beautiful turquoise waters. From the spectacular Over-The-Water Bungalows, to the grilled delights at Gordon’s, and even an intimate Over-The-Water Serenity Wedding Chapel. You can also enjoy the newly renovated Kelly's Dockside over-the-water restaurant at nearby Sandals Halcyon. 1,800 feet above sea level awaits a true tropical rainforest–19,000 acres filled with vivid flowering vines, luxuriant greenery, approximately 30 species of birds, and a whole menagerie of spectacular fauna. And, with 29 miles of trails running through this cornucopia of natural wonders, you can indulge in one of the guided tours of the rainforest and treat yourself to an experience you will treasure forever. All aboard! Experience the magical splendor of our unique Dolphin and Whale Watching Experience. Travel 2 miles out to the 3,000 feet deep ledge and follow this route down the west coast to Soufriere where the most spectacular sightings have occurred, a once-in-a-lifetime experience. On the trek back, you'll motor to the breathtaking Marigot Bay for a photo op before returning to the cove. Begin or end your vacation in style with a helicopter shuttle to or from Hewanorra International Airport (UVF). Hop aboard the helicopter and be whisked above the high mountains and lush terrain of this majestic island for a high-speed transfer between Vieux Fort and Castries. This shuttle offers a unique bird's eye view of the island that will take your breath away. Featuring an executive-style golf course, stunning oceanfront suites and the private enclave of the Sunset Bluff Village, this resort is recognized as the most sparkling jewel in the islands. 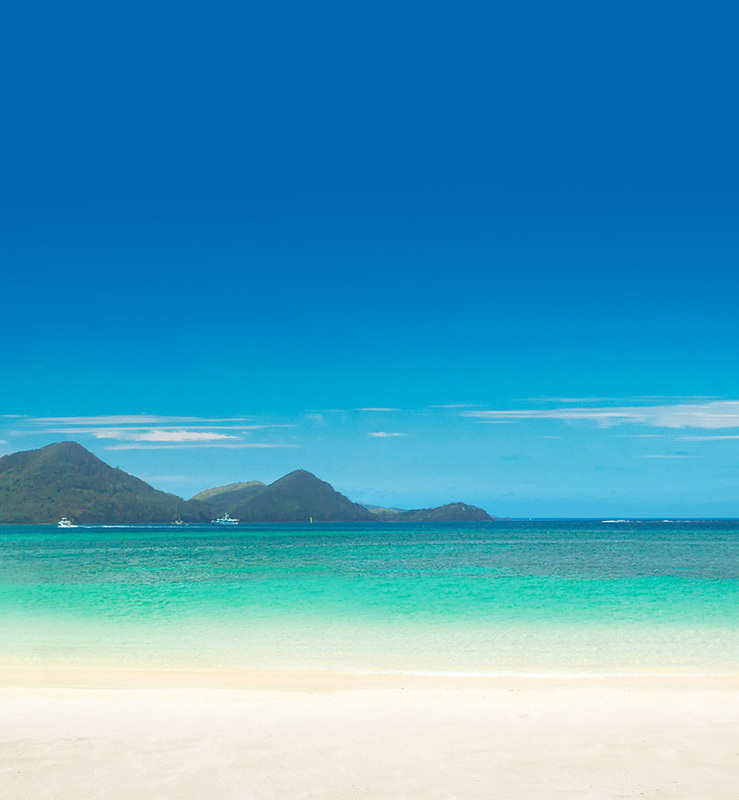 Ideally located on its very own peninsula, Sandals Grande St. Lucian is often described as the "closest vacation to a picture-perfect postcard" Cradled to the west by Rodney Bay and to the east by the majestic Atlantic Ocean. A true Garden of Eden by the sea, the resort's beachfront island architecture features gingerbread-detailed cottages that are no taller than the highest palm tree, ensuring gorgeous panoramas.